Refer to DTC P0013 (See page ). The valve timing is stuck at a certain value when in the advance range (2 trip detection logic). The valve timing is stuck at a certain value when in the retard range (1 trip detection logic). The ECM optimizes the exhaust valve timing using the Variable Valve Timing (VVT) system to control the exhaust camshaft. The VVT system includes the ECM, the camshaft timing oil control valve assembly and the VVT controller (camshaft timing exhaust gear assembly). The ECM sends a target duty-cycle control signal to the camshaft timing oil control valve assembly. This control signal regulates the oil pressure supplied to the VVT controller. The VVT controller can advance or retard the exhaust camshaft. If the difference between the target and actual exhaust valve timing is large, and changes in the actual exhaust valve timing are small, the ECM interprets this as a VVT controller stuck malfunction and stores a DTC. It takes 5 seconds or more to change the valve timing by 5°CA (Condition "A"). After the above condition is met, the camshaft timing oil control valve assembly is forcibly activated for 10 seconds (Condition "B"). DTC P0014 (Advanced Cam Timing) is subject to 2 trip detection logic. DTC P0015 (Retarded Cam Timing) is subject to 1 trip detection logic. These DTCs indicate that the VVT controller cannot operate properly due to camshaft timing oil control valve assembly malfunctions or the presence of foreign objects in the camshaft timing oil control valve assembly. More than 5°CA (Crankshaft Angle) for 5 seconds or more after the VVT hold duty ratio learned value reaches the upper or lower limit. If the difference between the target and actual camshaft timing is greater than the specified value, the ECM operates the camshaft timing oil control valve assembly for 10 seconds by applying and releasing oil pressure. Then, the ECM monitors the camshaft timing change for 10 seconds. Start the engine and warm it up until the engine coolant temperature reaches 75°C (167°F) or higher [B]. Drive the vehicle at approximately 60 km/h (37 mph) for 10 minutes or more [C]. Idle the engine for 3 minutes or more [D]. Enter the following menus: Powertrain / Engine / Trouble Codes [E]. Input the DTC: P0014, P0015. If the judgment result shows INCOMPLETE or N/A, perform steps [F] through [H]. 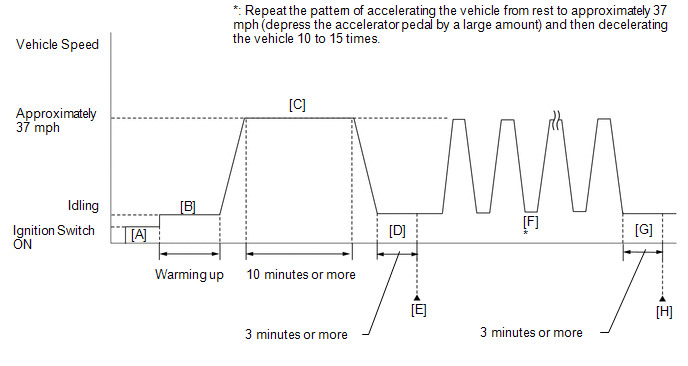 Repeat the pattern of accelerating the vehicle from rest to approximately 60 km/h (37 mph) and then decelerating the vehicle 10 to 15 times [F]. Depress the accelerator pedal by a large amount. Idle the engine for 3 minutes or more [G]. Enter the following menus: Powertrain / Engine / Trouble Codes [H]. Check the DTC judgment result again. Perform a universal trip and check for permanent DTCs (See page ). DTC P0014 or P0015 may be stored when foreign objects in the engine oil are caught in some parts of the system. The DTC will remain set even if the system returns to normal after a short time. Those foreign objects may then be captured by the oil filter. If any DTCs other than P0014 or P0015 are output, troubleshoot those DTCs first. (h) Drive the vehicle in accordance with the driving pattern described in the Confirmation Driving Pattern. (i) Enter the following menus: Powertrain / Engine / Trouble Codes / Pending. (j) Read the pending DTCs. DTC P0014 or P0015 may be stored when foreign objects in the engine oil are caught in some parts of the system. The DTC will remain stored even if the system returns to normal after a short time. These foreign objects may then be captured by the oil filter. (a) Replace the camshaft timing exhaust gear assembly (See page ). Perform "Inspection After Repair" after replacing the camshaft timing exhaust gear assembly (See page ).